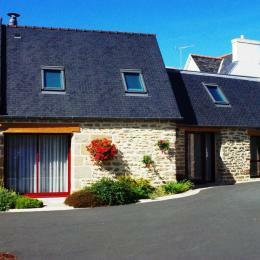 Keraluic is a typical Breton farmhouse, wich lies in the middle of the countryside, and 5 km. from the beach. 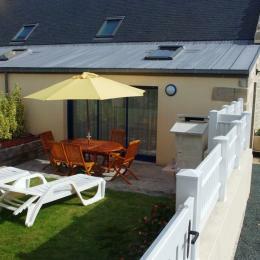 In our Chaumière you'll find on the first floor a luxury three-room Gite for 5 persons. It has two very comfortable, big and cosy bedrooms. One of the bedrooms has a double bed and the other 3 single beds. Bedding is provided and the beds are made up at your arrival. There is a baby cot and a high chair available. Each bedroom has its own on-suite bathroom with shower, toilet and washbasin. In the living area you will find a comfortable couch, chairs, colour LCD-TV, and a DVD-player. In the Gîte is free WIFI. There are two small balconies with a wonderful view. You also have a sunny terrace with a barbeque.